What they spent: The project cost around £595,000. Years passed between Carol and David Spenser’s initial plans to convert their barn and the day they moved into it as their new home. The council’s stipulation that the design should be as close as possible to its early-19th-century origins remained one of the greatest challenges. Find out how they overcame it, then browse through more real home transformations and learn more about converting a barn, school or church. Glazing fills one wall of the impressive porch, flooding the space with light. Metal struts support the structure, without interrupting the visual lines. Plasterboard provides a backdrop to the weathered oak beams, dating from the early-19th century, and allows them to stand out. Carol and David chose engineered antique oak floorboards – brushed and black-oiled to enhance knots and splits – for the main living space and the bedrooms. ‘We wanted something with character, to resonate with the features of the barn,’ Carol explains. A bespoke staircase, made by local carpentry firm Weybread Woodcraft, frames one of the leather Multiyork sofas. The lower ceiling in the family space, which is open-plan to the dining area, creates a cosy feel. The barn was weatherboarded with larch, which was then painted black in keeping with the local vernacular. 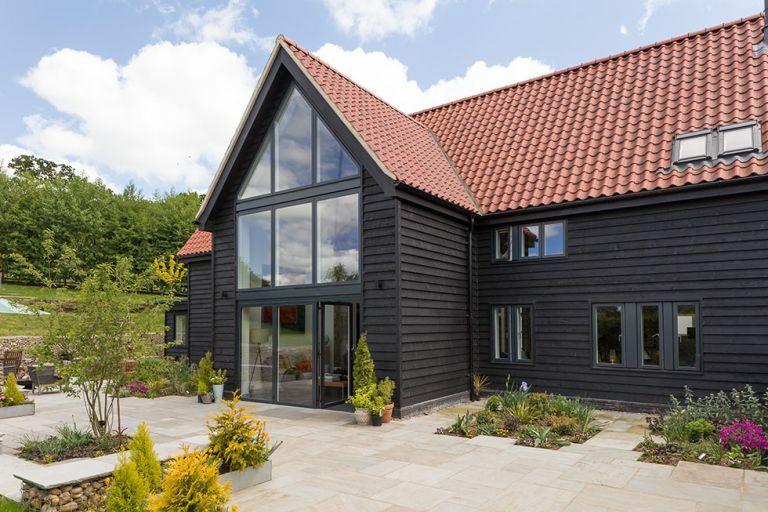 The windows from Velfac could only be used in existing openings, and have frames that are powder-coated aluminium on the exterior and wood internally. • The full feature – including stockists and more images – appears in the November 2015 issue of Real Homes. Subscribe today to take advantage of our money-saving subscription offers.